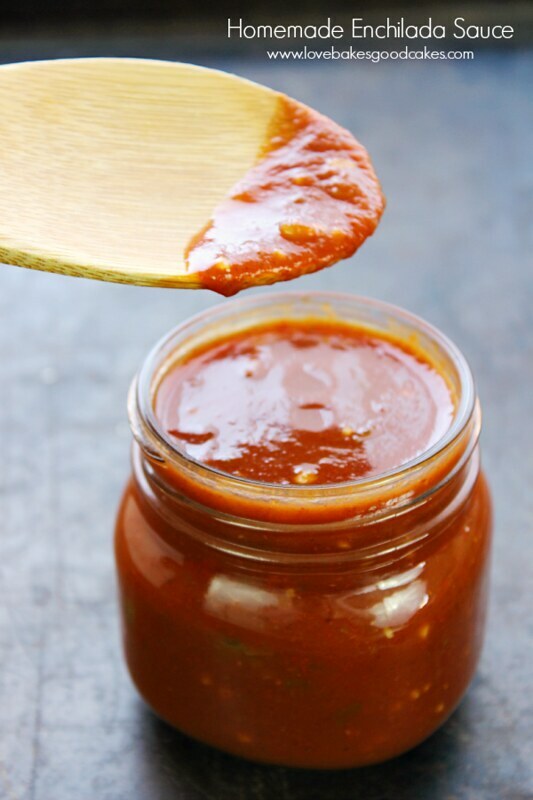 Ditch the canned stuff for this awesome Homemade Enchilada Sauce! 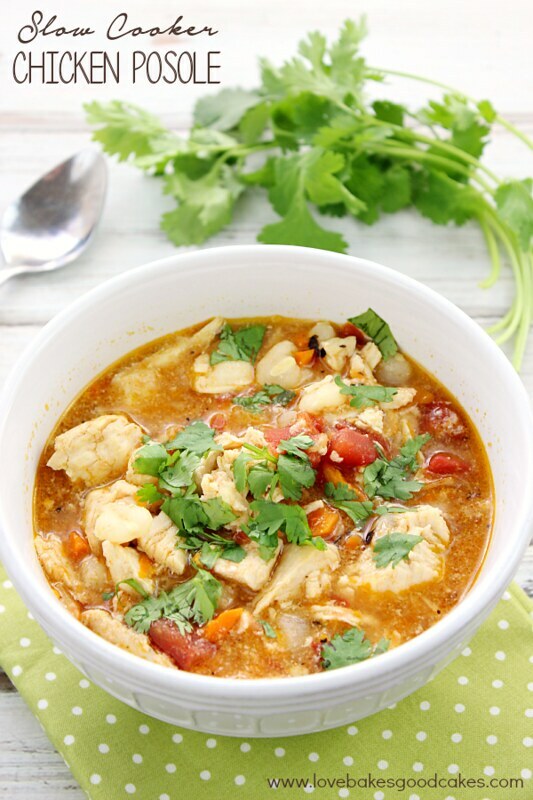 It has tons of flavor and it is so easy to prepare! When I was (much) younger, my mom had a friend named Sharon. I don’t remember too much about her specifically, except that one time we went to her house and we ate some really awesome enchiladas. Oh, and her kiddos taught my brother and I how to say all of the bad words in Spanish …. About those enchiladas Sharon made … I honestly can’t remember if I ever had enchiladas prior to that day. If we had, Sharon’s enchiladas made enough of an impression on me that I still remember them thirty-something many years later. It was also the first time I had refried beans that weren’t from a can. It was one of the best meals I have ever had in my life. I had forgotten about Sharon and that meal (and what her kids taught us lol) until a few years ago. I’m not even sure what sparked that memory. I asked my mom if she remembered that lady … to which I could see it visibly upset her. Just a few days prior, Sharon had passed away …. and I had no idea. I felt horrible for asking and the timing of my question suddenly felt very inappropriate. This enchilada sauce reminds me of the enchiladas Sharon shared that day, so many years ago. I am sharing my version of Sharon’s enchilada recipe in this Beef Enchiladas post if you would like to check it out too! 🙂 I hope you enjoy! 1. In a medium saucepan, combine all of the enchilada sauce ingredients. Bring the mixture to a boil over medium-high heat, stirring occasionally. Once the mixture comes to a boil, reduce the heat to low and simmer uncovered for 5 minutes or until slightly thickened. 2. 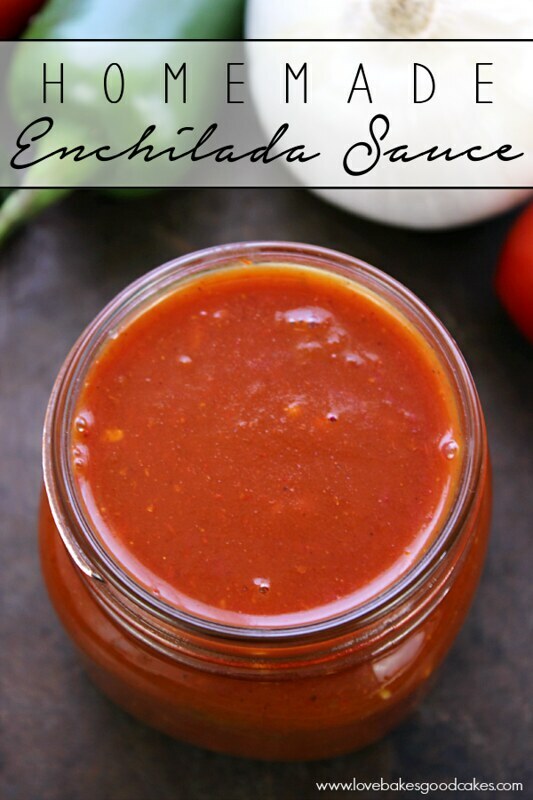 Use this enchilada sauce in your favorite enchilada recipe or anywhere enchilada sauce is listed in the recipe! I have never made enchilada sauce before. This recipe sounds so yummy and pretty easy too! I will have to give it a try. Thanks for linking at the In and Out of the Kitchen Link Party! Yum! 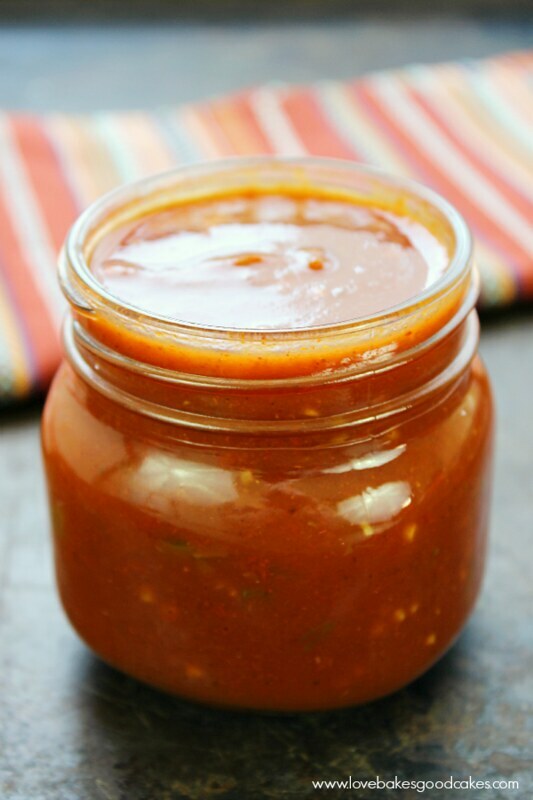 I've never made homemade enchilada sauce, but it seems simple enough. I may have to try it next time! We love Enchiladas and Wet Burritos and this recipe would be the perfect addition to them, and I love the fact that I then do not have to use canned or jarred sauce anymore! Pinning. I love enchiladas and am always on the lookout for a new sauce recipe. Thanks! BTW, when my son was in high school we housed some German exchange students. I will say that, of course, the English speaking students wanted to learn all of the bad words in German, and of course the Germans couldn't wait to find out how to say bad words in English! Hahaha – my husband and I learned quite a bit also! We had a wonderful time with the kids and, surprisingly, one of their favorite foods were tacos and enchiladas! Thanks for sharing this! 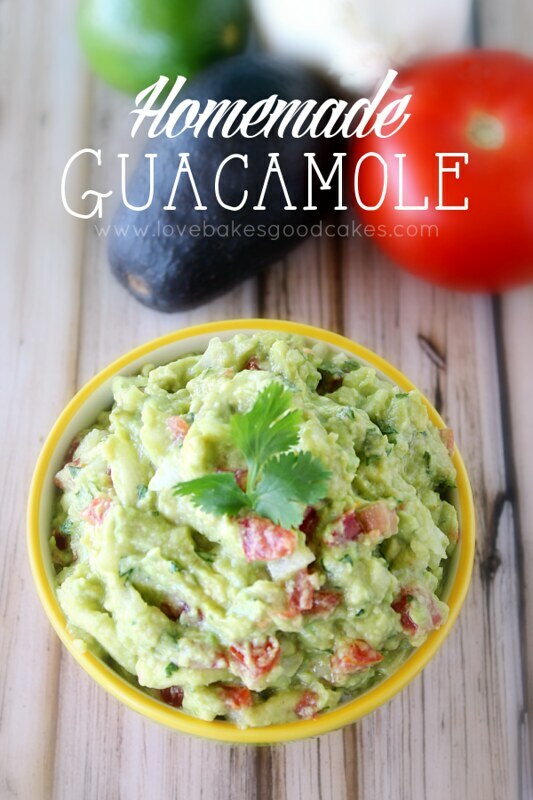 I am so guilty of buying the canned stuff but this recipe seems simple enough to make my own! Pinned this!! Thanks for the recipe Jamie! I've been looking for an easy enchilada sauce because I don't really care for the stuff in the can. I loved the party of your story about the bad words! It made me remember that just last school year my kids tried me with some bad language spoken in Spanish that they're friends taught them. Needless to say they were quite surprised when momma knew everything they were saying because she had been taught those same bad words:) The looks on their faces…priceless! This sounds great!! I love this idea and how I can adjust the spice level too! I love homemade sauces. I have an enchilada sauce I love and I haven't purchased a can of it since. Homemade is the best. What a sweet story to have associated with this recipe! And funny because I made homemade enchilada sauce for the first time last week for my mom's birthday! It was amazing. The recipe I used/altered was different than this though… more things to try! Jamie, your picture literally stopped me in my tracks as I was scrolling through Treasure Box Tuesday. Homemade Enchilada Sauce makes my li'l Texan heart go pit-a-pat. I think this post is a wonderful tribute to Sharon. 🙂 ♥ Pinning in her honor. Jorden is a HUGE enchilada fan….as in enchiladas are the only thing he ever orders at a Mexican restaurant! I love this homemade sauce and I'm sure he would too….and I'm sure you're making Sharon proud! This looks wonderful and delicious! I love enchiladas, and one of the main reasons is the sauce. Thanks for sharing! Homemade is always so much better than the canned stuff! Pinning! Thanks for the recipe! I love homemade anything! Never thought of making my own sauce. Looks like a good recipe. I love the idea of using a homemade sauce!! Thanks for sharing. Yum! We have enchiladas somewhat regularly and I'm always looking for a good homemade sauce recipe. I hate buying the cans of it. 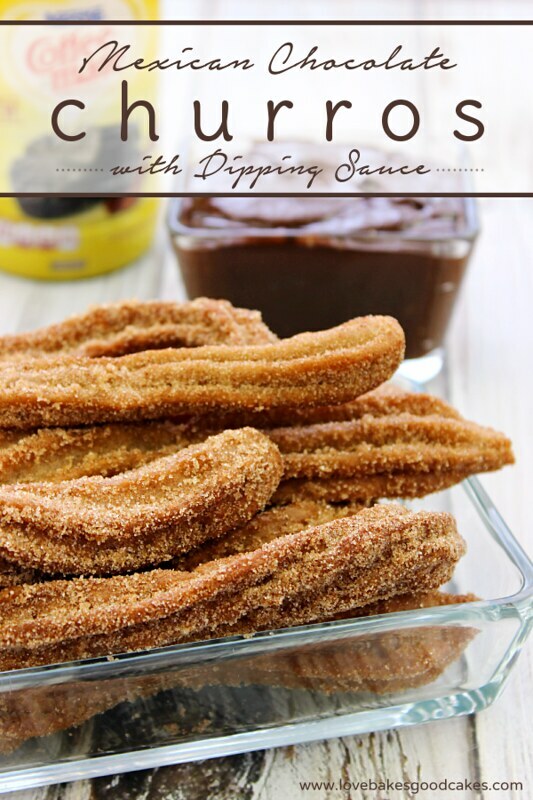 We love using enchilada sauce in recipes, so I will definitely have to give this a try. Homemade sauces are always better! yum!! Looks so good and fresh! Oh and I love your new headshot!!! You know, I live in Peru, and my husband and kids are Peruvian. Funny though, since I introduced them to Mexican style food, they prefer that to all the Peruvian food! Doesn't make my mother in law very happy – lol! I need to try this! and your churros look fabulous as well. I knew the moment I saw this sauce, I had to try it! I love how easy it is to make! Thanks for sharing, Jamie! I always make my own enchilada sauce now. And, there's almost always a jar in the fridge or the freezer now (just in case I need to make dinner and I don't have anything planned). 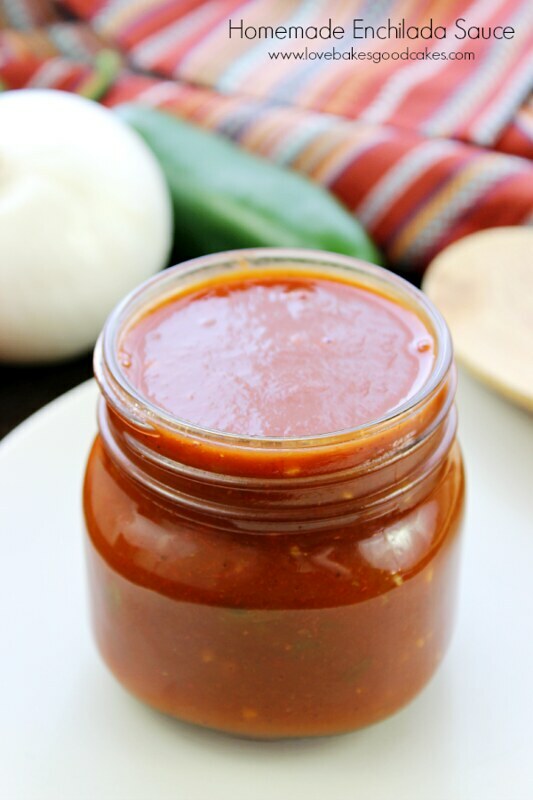 Enchilada sauce is a great way to start dinner! Thanks for sharing your recipe. It looks great! I remember my cousin visiting from New Mexico. His wife owned a Mexican restaurant and she cooked dinner for us. She said that she spiced everything like she does for her kids. We never drank so much water with dinner but it was the first authentic Mexican food I ever had. I buy jar Enchilada sauce.. this looks easy enough and probably tastes way better. Pinned. Thanks.